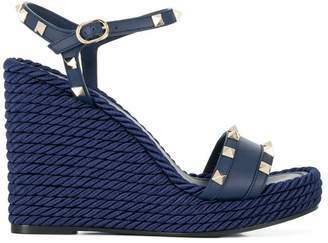 Valentino - Valentino's black leather sandals typify sleek, understated elegance. They're crafted in Italy and feature light gold-tone metal Rockstud embellishments across the foot-framing T-bar straps, while an apricot-beige leather sole and small stacked heel ensure a comfortable foundation. Slip them on to toughen the appeal of a floral-print dress.